| Blockade or Embargo Against Cuba? Blockade or Embargo Against Cuba? Somos+, Wilfredo Casañas, 22 January 2016 — The so-called economic blockade or embargo by the United States against Cuba is an old an decayed quarrel between the two countries that has been used for the most varied ends, disquisitions that I will not use to affirm or deny what was said by famous characters from the fields of politics, law, lierature and culture in many countries. I will limit myself to confirming the meaning of some elemental concepts, such as a “blockade” that implies that a country’s coasts are surrounded by naval fleets that block international commerce, isolating it. According to our actual history since 1959, Cuba was only partially blockaded during the days of the “Missile Crisis” in October of 1962, when the American fleet blocked the passage of ships from the USSR and Eastern European countries becuase of the danger that they might be transporting weapons. These events had a historical antecedant. In the “Cold War” between the United States and the USSR, Fidel Castro followed the strategy of allying himself with the Russian and seeking to make the Americans enemies, and allowed Soviet nuclear weapons to be placed in Cuba. This was discovered by American U2 spy planes, and President John F. Kennedy demanding that the Soviet governemnt remove the missiles from Cuban, which was complied with halfway. During the events that occurred in 1962, when a group of Cuban exiles invaded Cuba at the Bay of Pigs intending to overthrow the ruling regime, the United States did not provide air and naval support to the iperation. Therefore, the term “blockade” is not applicable to the decades-long tension between Cuba and the United States. The Torricelli Law was approved by the US Congress and signed by President George Bush (the father) in 1993, and the Helms-Burton Law was approved by the House of Representatives and the Senate of the United States in 1995. Both laws were enacted with the purpose of economically strangling the Cuban regime. 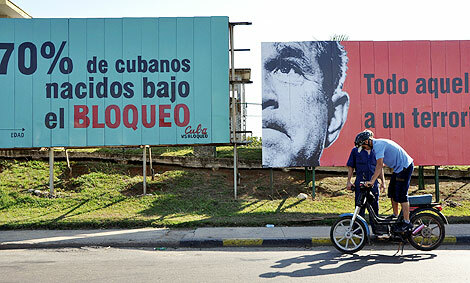 While it’s true that pressures from U.S. presidents against powerful “Made in USA” companies managed to limit trade with Cuba, it is also true that large and deep gaps remained and the ineffectiveness of such measures was shrewdly exploited by the rulers of the island, for many years, to open trade relations with the entire world, including with the United States itself. Thus, the term “economic embargo” is not morally or legally applicable to all of the above and has only been used to try to justfiy the infinite failures of Communism in Cuba. But something more important than these conceptual differences, is the real and merciless “blockade” that the dictatorship maintains against its own people, making everyday life in the country harrowing every day. There are multiple prohibitions by the regime against Cubans: We cannot have legal organizations, movements or parties other than the Communist, there is no freedom of assembly if it is not organized by the government on matters of interest to them and they do not allow dissent. They collect impossible taxes from poor entrepreneurs who have huge debts to the State in the process of achieving their dreams and economic improvements. Food is increasingly scarce and of lesser quality, even that is is produced here in Cuba. Indoctrinations continues in schools and mass organizations are used to promote their invariable message, and so on for a long list. This is the real Blockade and it is imposed by those who are governing our beautiful Cuba. Will we stand with our arms crossed listening to excuses and blaming somebody else for our problems without the power to solve anything? Or are we going to see the reality of the matter and take responsibility like Cuban citizens? The major problem is internal and the best solutions are also internatl but be need more commitment and willingness to change.